I’m never going to get it done. 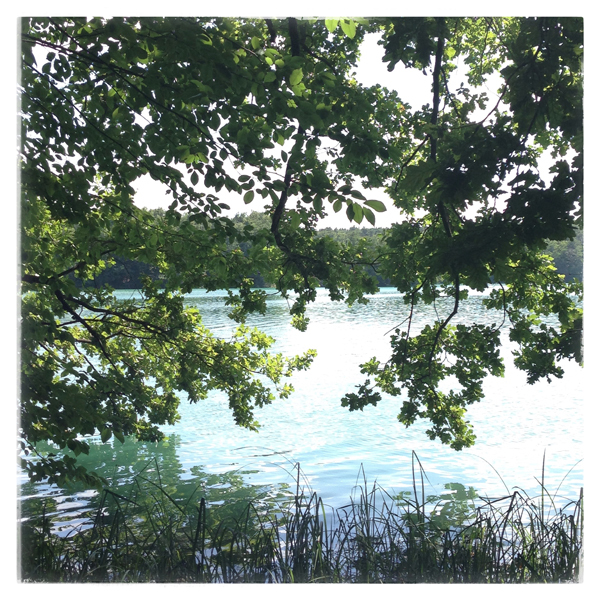 That’s what it felt like when I sat down once again last summer to write a list of my favourite spots in Berlin. And couldn’t finish it. Shouldn’t I wait until that new shop opens that everyone is already talking about? Until I’ve been to that one café I’ve been meaning to visit forever? Until I can recommend more in West Berlin? But then there’s always going to be a new shop, a hip neighbourhood, a chic bar. That’s the beauty of this town. It’s too big, too much, too great to ever tick it of in 30 neat points on a list. Yet I wanted to write about the places that I like in Berlin. Because I like being in Berlin, period. It’s been seven years this summer. I haven’t lived anywhere longer, apart from at home with my parents. It just kind of happened, in that way it does when you decide to stay somewhere without making it a huge decision. James and I moved here for jobs, we stayed after we lost them, started something new, rebooted our lives, became a family. Sometimes it feels like we opened the door to our apartment for the first time yesterday. Other times it all feels so familiar. A friend of mine once said that the good thing about Berlin is that you’re never the final guest to crash the party. The good thing about Berlin is also that you want to share your city with the guests that arrive after you. I like that this town belongs to a lot of people instead of only a few with a lot of money. That it doesn’t need a big ego to be a big city. That it annoys me sometimes, but I can never stay mad at it. I like that we felt at home here in an instant. I had made a Google Maps with places that I’d heard about and thought might be important to know before our move. Some of those places don’t exist anymore, others were disappointments, quite a few of them I never visited, because I found something else and better. Now I’ve covered the city in my own pins – seven years worth of favourite places. Maybe I should’ve waited until I’d had the time to check out C|O BERLIN in its new home, the Amerikahaus. Or until I could judge for myself if CHUTNIFY really is the first decent Indian restaurant in Berlin as everyone keeps telling me. I could’ve added DISTRIKT COFFEE to the list, because it’s such a lovely place. Maybe next time. By then I’ll hopefully also be able to add some addresses that aren’t in Mitte and Prenzlauer Berg, which just happens to be where we live and spend most of our time. That’s my resolution for the next seven years: see more of my city. It’s too big, too much, too great not to. THE STORE x SOHO HOUSE | Torstraße 1 | OK, so this place has also only recently opened. But it’s exactly what’s been missing. Because The Store isn’t strictly a store, but rather a really good excuse to hang out all day. The café serves fresh and delicious food, there’s a nail salon und hair dresser in store, plus a huge co-working space, should you really have come to work. And then there’s the shopping. The fashion plays in the Champions League (The Row, Christophe Lemaire, Mark Cross etc. ), but sometimes you gotta reach for the stars, right? Everything else – beauty products, stationery, books, music, tableware and especially the fabulous flowers from Mary Lennox – is just beautiful as well. WALD | Alte Schönhauser Straße 32c | When I grow up, I want to be as cool as Dana and Joyce from Wald. The fashion they curate for their store is unexpected, laid-back and always special. On my wish list: the „Je t’aime Jane“ sweater from Bella Freud. Never a bad choice: intimates and tees from A.O.cms. Most recent discovery: jewellery from Sukathi. My bracelet with the inscription „oh boy“ that I was given for Arlo’s birth is sacred to me. SOTO | Torstraße 72 | It’s simple: as long as shops for men are this good, I’ll keep buying their clothes – like pullovers from Folk, sunglasses from Han Kjøbenhavn, t-shirts from Kitsuné. Besides, the dressing rooms at Soto are so good-looking you’ll want to move in. THONE NEGRÓN | Linienstraße 71 | Ettina Berrios Negrón designs dresses that you want to wear forever. I lost my heart to the Willow Summer Dress a long time ago: it’s grown-up, feminine, subtly elegant und simply romantic, just as the rest of her designs. This is the kind of designer you’d want to make your wedding dress. Luckily, Ettina has just started doing a bridal collection. WOOD WOOD ANNEX | Rochstraße 3 | Berlin got me hooked on sneakers. Wood Wood Annex deals the best stuff, e.g. from Eytys, Common Projects and Adidas. BLUSH | Rosa-Luxemburg-Straße 22 | It’s not as though shopping for a bikini is on my list of favourite things to do in general. But at seven months pregnant? Oof. Thanks to the good care and expertise at Blush I found a great-looking bikini that I felt very comfortable in. Hoping to find the same thing now that I’m not-pregnant again before our next beach holiday. In case you’re not looking for beachwear: Blush also has charming lingerie. SCHUHMACHEREI ALEXANDER | Pappelallee 89 | Unless you only ever wear sneakers, Berlin’s pavement will ruin all of your heels eventually. Take them here to get them fixed. These guys have masterfully repaired every single pair of shoes I’ve ever brought them. They’re wizards. PANAMAHÜTE | Kollwitzplatz 1 | If only I could remember the vendor’s name. You’ll find him anyway. He’s behind the stand on Kollwitzmarkt with the most beautiful panama hats for summer. Every Saturday. LOTUS MASSAGE | Zionskirchstraße 34 | By the time the masseuse stands on my back I usually wonder why the hell I’m back for another traditional Thai massage. I always get my answer the next day: the back pain is gone! You’ll get no scented candles here, no panpipe music, no frills, just a fantastic kneading. TRICIA C. PAHL | Oberwallstraße 12 | My friend Elisabeth once recommended her with the words: Tricia’s pedicures last five weeks. She wasn’t lying. I haven’t tried any of the beauty treatments there yet, but I’ve heard their equally fabulous. 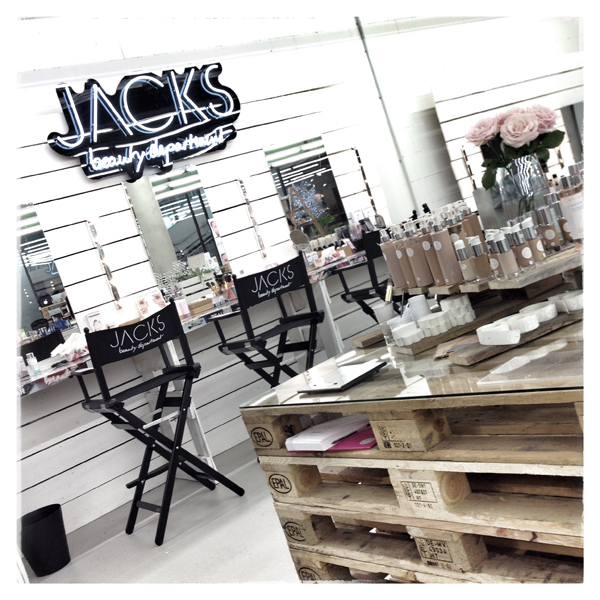 JACKS BEAUTY DEPARTMENT | Kastanienallee 19 and Bikini Berlin | I recently took a beauty lesson at Jacks and was taught that even after 20 years of doing my own make-up, I still have things to learn about eyeliner, concealer and primer (more on that soon). Owner Miriam truly is an expert at finding products that work. I discovered the life-changing, yes: life-changing, Beauty Blender here. Current obsession: Danish beauty brand Karmameju, especially the scented candles. WHEADON | Steinstraße 17 | Had to be on this list for the simple reason that I found the Hydrating Serum from Luxsit here, which helps my face pretend it’s still in its early 20s. It’s also worth mentioning that Weadon doesn’t stock a huge variety of brands, but the ones they do are absolutely convincing, like Und Gretel, a new organic beauty line from Berlin. Plus, they don’t forget the guys. When I gave James the beard wash from OAK as a Christmas present – his beard was getting Santa like – he laughed at me. Now half the bottle is gone. FINE & DANDY | Lychener Straße 43 | I can’t believe that there’s a sweeter, more attentive or less pretentious hair stylist in all of Berlin than Franko at Fine & Dandy. Also, he’s very good at cutting hair. MDC COSMETIC | Knaackstraße 26 | A visit to MDC is like taking a deep relaxing breath. Everything here’s so devoid of vanity – the products, the atmosphere, the owner Melanie dal Canton – that other cosmetics shops seems stuffy by comparison. Take some time to smell your way through the perfume selection. If you’re in more of a hurry, try and buy a soap or cream from lovely Grown Alchemist. I’m currently fantasizing about one of the hand mirrors Saskia Diez designed for MDC. PARKHAUS | Schröderstraße 13 | The problem with Parkhaus is that I always end up wanting things that I didn’t even know I needed beforehand. Like linen bedsheets. Or delicate glass carafes. Or a duster made from ostrich feathers. Then again I also always find things that I know I need, like last-minute birthday gifts and sweet prezzies for kids. LUIBAN | Rosa-Luxemburg-Straße 28 | Fine paper, cards and notebooks that’ll make you want to return to handwriting only, as well as precious accessories for a better-looking office. Thanks to the the letter opener „Birdie“, I’m suddenly enjoying opening bills. OK, that’s a lie. But don’t dislike it so much anymore. TING | Rykestraße 41 | Laura has such a enviable way of combining furniture and home accessories from Scandinavia and the Far East that it’s nearly impossible to leave her shop without buying something. MODULOR | Prinzenstraße 85 | Modulor makes me wish I was better with my hands. There’s three floors chock-full of materials for any home DIY or art project imaginable. Thankfully, even those of us who are all thumbs will find great supplies. The japanese Katazome wrapping paper is a gift in itself. 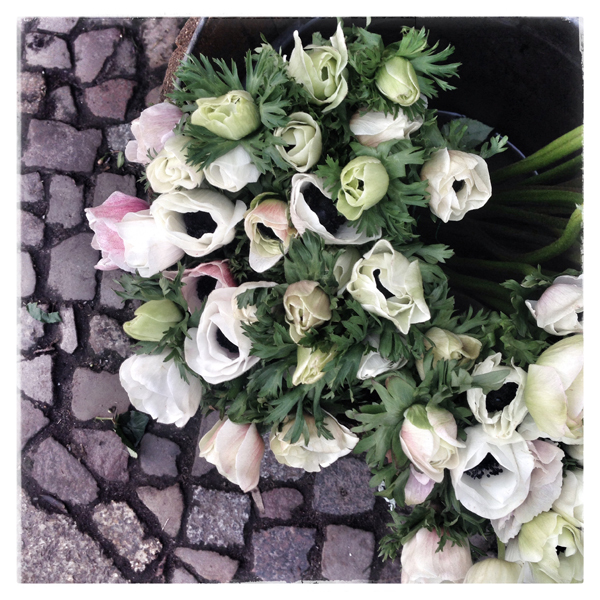 BLUMENBETT | Kollwitzstraße 90 | There’s little that lifts my mood more effectively than fresh flowers in the apartment. I like buying them at Blumenbett or from TRANGLY (Marienburger Straße 8). SCHOEMIG PORZELLAN | Raumerstraße 35 | I wouldn’t mind seeing those flowers in vases from Schoemig. I’ll also take the coffee mugs. And plates. And espresso cups. Gorgeously minimal china. SODA | Weinbergsweg 1 | Why do I keep a Vanity Fair from 1995? Will I ever take another look at the first issue of Gentlewoman? How soon before I have to move all of my British Vogues from the floor to keep them safe from Arlo? I’m sure we could use the space in our apartment that is taken up by my magazines much better. I just can’t get rid of them. Some day, I might look inside one of those old SZ Magazins again, re-discover a story I adored the first time I read it and fall in love with it all over again. As much as I’m online, I’ll adore magazines until they stop printing them. I get my refills at Soda, where you’ll find a ton of interesting international magazines, plus wonderfully nutty books like „Russian Criminal Tattoos“ or „Where’d You Get Those? – New York City Sneaker Culture“. OCELOT | Brunnenstraße 181 | More books? Print? And digital? Come to this place, thankfully my neighborhood bookstore. Thankfully, because their selection is fantastic and the café is so inviting you’ll want to stay right there and start reading your new book. Ocelot also has an astonishingly comprehensive online shop, a good alternative to that other online bookseller with A.
MAGASIN | Lychener Straße 3 | When you’re looking for nice furniture in Berlin, you often either find yourself at the bank extending the overdraft or haggling with the wily dealers on Arkonaplatz fleamarket, who try to pass any old junk off as mid-century modern. In between those two options is Magasin. They sell furniture from the 1950s onwards and while it’s not cheap, it is masterfully restored and can be upholstered in a fabric of your choice. 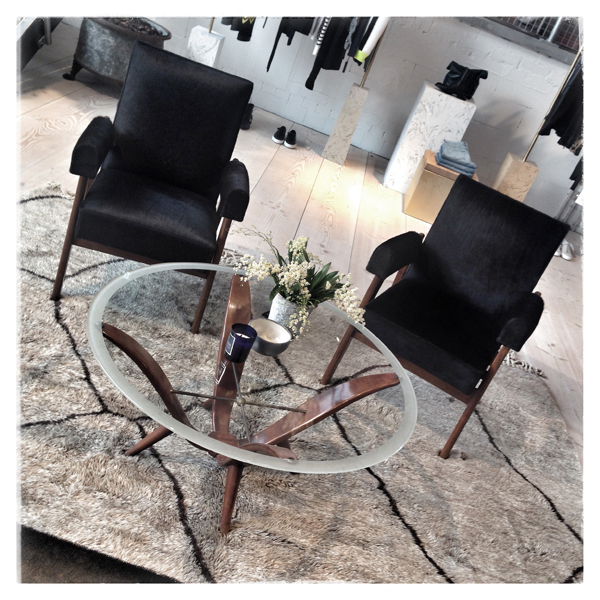 Keep checking their website for new offers and you might find a bargain like the wooden chairs in our living room. GESTALTEN SPACE | Sophie-Gips-Höfe | Gestalten Space might be the fancier name. But inspiration filling station would be just as fitting. The books on offer, the beauty of the design and art objects, the ideas for kids – it fills my tank every time I go. TINY | Schröderstraße 14 | Anne’s store has had a special place in my heart since we bought Arlo’s first onesie there when Arlo didn’t even have a name yet. It came from Mini Rodini and I’ll never part with it. Right now I’m taken by the cool tights from Hansel from Basel and everything with stripes from Mads Nørgaard. Good news, Non-Berliners: Anne has finally opened Tiny as an onlineshop. WALKING THE CAT | Mulackstraße 7 | Daria on the other hand has finally expanded her onlineshop into a stand-alone store. 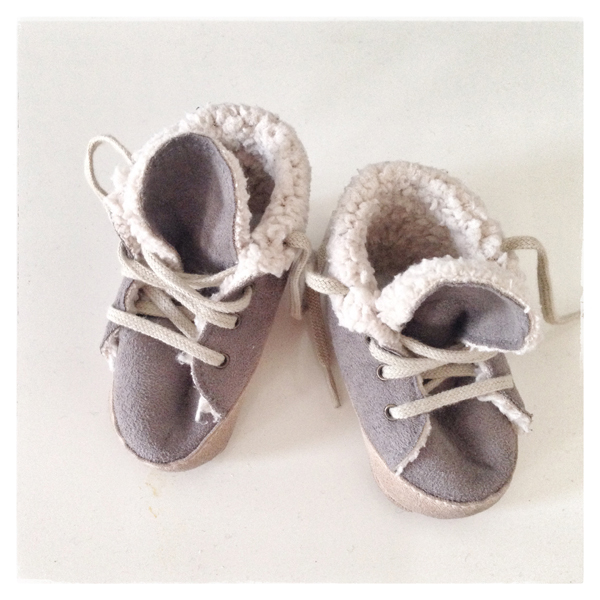 So the temptation to blow a month’s budget on childrens clothes has doubled, as Daria has the most delightful things from Imps & Elfs, Noé & Zoë, Tocotó vintage, Bobo Chose or Salt Water Sandals. D.NIK | Wörther Straße 14 | The furniture and toys at d.nik are so pretty and well-designed, it makes you wish they did them in grown-up versions too. WINZIG + KLEIN | Veteranenstraße 24 | Looking for gifts for a birth, a birthday, a christening? Right this way, please. Parents eventually stop buying the kind of beautiful but often expensive knitwear you’ll find here for their babies, but that doesn’t mean they won’t love it as a present. LILA LÄMMCHEN | Dunckerstraße 79 | Did I think that I’d ever seriously shop in a place named the lilac lamb? No, but then I also didn’t think that woolen onesies would one day become so important. I haven’t found better ones anywhere. ZEIT FÜR BROT | Alte Schönhauser Straße 4 | There isn’t a day that couldn’t be improved by a cinnamon roll from Zeit für Brot. However, a poppy seed roll will also do. Or one with white cocolate. Or with cherries… ah, it’s good thing the year has 365 days. BETTY’N CATY | Knaackstraße 8 | James: „Did you hear? There’s a new café on Knaackstraße that serves poached eggs on avocado bread.“ Me: „No!“ James: „Yes!“ Me: „Why are you still sitting on the sofa? Let’s go!“ When James and I went to Australia a few years ago, we’d see poached eggs on every menu – and I had a new favourite dish. Finding places that serve eggs that way in Berlin? Almost impossible. Until Betty’n Caty opened. The lovely café – deep couches, dark wood bar, white subway tiles – gets very busy around breakfast time on weekends. I’ve no idea if everybody else comes for the eggs too. The rest of the menu is definitely worth a visit and not just for breakfast. I can recommend the toasted sandwiches, quinoa salad and fig quiche. 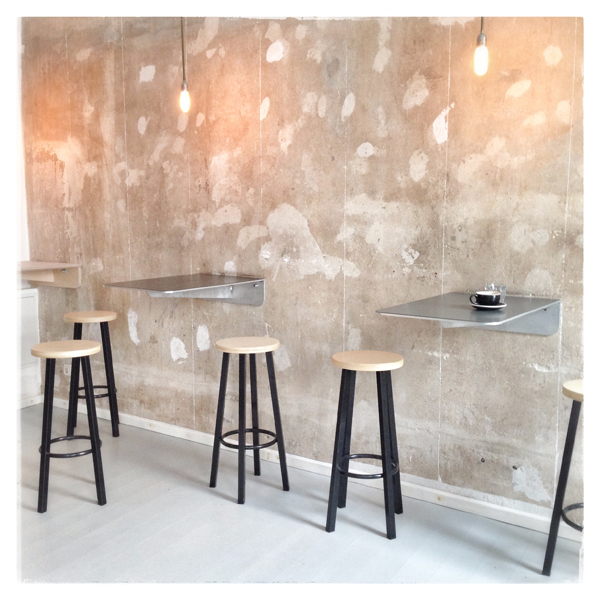 NO FIRE NO GLORY | Rykestraße 45 | Something else I learned in Australia: to love a flat white. Now every other café in Berlin serves them, a double shot of espresso with – thanks, Wikipedia – microfoamed milk. At No Fire No Glory they make them consistently perfect. Order one with a warm slice of banana bread. Once the weather gets warm, I’ll race you for a spot in the canopy swing under the cherry tree outside the café. BONANZA COFFEE | Oderberger Straße 35 | Really, I mean really good coffee. Even my dad, a committed machine coffee drinker, has been turned around by Bonanza. Ever since he’s had an espresso here, I have to ship him beans from the Bonanza roastery every few months. 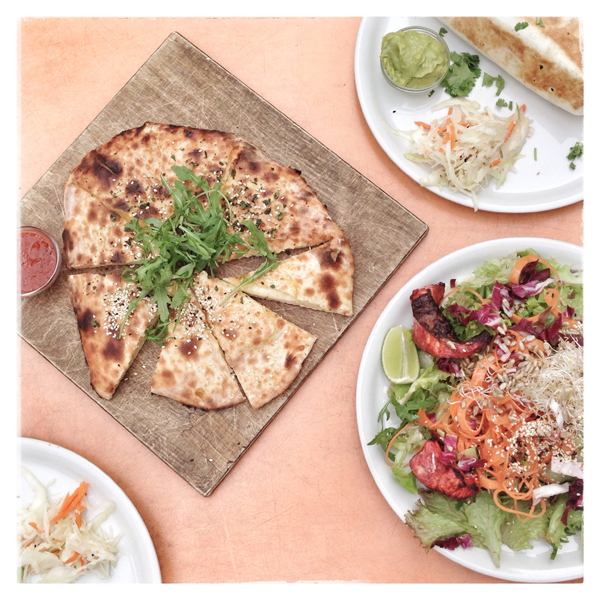 ZIA MARIA | Pappelallee 32a and Winsstraße 21 | Waferthin dough, mouth-watering toppings, reasonable prices. Makes for my favourite takeaway pizza. Get the DVDs for pizza night from FILMGALERIE (Invalidenstraße 148). JORIS | Brunnenstraße 158 | What did we have for lunch before Joris opened? Never mind. The baked potatoes, salads and soups have become indispensable. Lunch tastes even better on the steps outside when the sun’s out. Oh, and if you live in Hamburg: Joris opens a new branch in City Nord in March 2015 (JORIS HAMBURG). DU BONHEUR | Brunnenstraße 39 | After Joris is before Du Bonheur. Although there is never a bad time to visit the patisserie. The eclairs, mille-feuilles and tartes are almost too beautiful to eat. Although eat them you will. And then hum the Marseillaise as the sugar gets to your head. DALUMA | Weinbergsweg 3 | Eating a Daluma salad makes me think I’m grazing in a field. And I mean that as a compliment. The ingredients for their vegan and raw dishes are so green and fresh, you feel like they’re straight from the farm to the fork. There are coldpress juices and smoothies to choose from, soups, salads, healthy snacks and breakfast options like chai pudding. Wakes you up like an alarm clock: the Choc-Choc Crave smoothie with raw cocoa, moringa, maca, avocado, banana, dates, rice cream and cocoa nibs. It’s phenomenal. RESTAURANT 3 and BAR 3 | Weydingerstraße 20 | Why don’t we go to Restaurant 3 more often? That’s what I always ask myself when we’ve been. Maybe because it doesn’t advertise itself and has no website. It’s no secret though that the atmosphere is incredibly relaxed, the staff charming and the food simply great. You’ll find dishes like artichokes in aioli, osso bucco or tagliatelle al ragù on the Italian menu. Go for a Kölsch beer in the Bar 3 next door afterwards. It’s basically the antechamber to the Volksbühne and it’s always fun to watch the theater crowd smoke and act their way through a Friday night. MÄDCHENITALIENER | Alte Schönhauser Straße 12 | The longer you live somewhere, the more of the places you like shut down. Mädchenitaliener is still there, as loud, busy and cosy as on the first night I visited. The pasta with figs, a classic, is still as heavenly as it was then. ZUM DRITTEN MANN | Kollwitzstraße 87 | Sure, you could have something else at this Austrian restaurant. But it would be a crime not to order the Schnitzel with warm potato salad and creamed cucumber. The large one, obviously. W – DER IMBISS | Kastanienallee 49 | Because the fridge is empty. Because the fridge is full, but we’re too lazy to cook. Because we’re expecting visitors. Because it’s Tuesday. Because James only has to say the words „cheese naan“ and we’re there five minutes later, queueing for a take-out. The kitchen is Indo-Mexi-Cal-Ital. Not my words, but the words of chef Gordon W., who still cooks most nights and is unmissable in his Hawaiian shirt and straw boater. He serves burritos and fish tacos, currys and swami burgers, naan pizzas and warm salads. My favourite is the Delachs menu: tandoori marinated salmon with curried vegetables. And the cheese naan. So good, it should be illegal. MARIA BONITA | Danziger Straße 33 | A recommendation from James’s friend Oliver (who runs the Nalu Diner and knows his food) and one I’ve been grateful for ever since. The best Mexican in town, Oliver said. The burritos, quesadillas or hueves rancheros truly are unrivalled. You wouldn’t want to spend all night in this takeaway, but the wooden benches outside become much more comfortable after the first round of margaritas. Ask the guys about their home made tortilla chips, then buy a bag for your next party. They’re sensational. DUDU | Torstraße 134 | Sorry, is that… George Clooney? Possibly. He’s been known to eat here when he’s in town. Of course, Berliners don’t bat an eyelid just because GEORGE CLOONEY IS SITTING ON THE TABLE NEXT TO THEM and will calmly keep spooning their pho soup. It is pretty faultless soup. So is the Sushi here. I could never get tired of ordering the Crunchy Dudu Rolls, Seafood Bowl or Roastbeef Noodles. TOMMI’S BURGER JOINT | Invalidenstraße 160 | This is just a theory, but Icelanders are a funny bunch. At Tommi’s, an Icelandic institution, a burger with fries and soda for 9,90€ is called the „offer of the century“. The menu is almost hilariously short: burger, cheeseburger, veggie burger, steak burger. That’s it. And that’s all I need when the burgers are this good. Even better with a dollop of béarnaise sauce on top. Do try the chocolate malt milkshake. Just not right before the burger is served. That milkshake is a meal. THE BIRD | Am Falkplatz 5 | It would be impossible only to name one burger place in Berlin. The Bird makes grown men cry – with joy. A few rules: Do not order your burger well done or the chef might come out of the kitchen with a meat cleaver. Put away our cutlery and use both hands. Do not think you still have room in your belly for a slice of cheesecake after the burger and still be able to walk home. And, please, book a table a couple of weeks in advance. This place is ridiculously popular. NALU DINER | Dunckerstraße 80a | Good ol’ American Diner food: burgers served in plastic baskets, pancakes as thick as novels and French Toast as soft as eiderdown. Which is what you’ll want to lie down on after a massive Sunday brunch here. VICTORIA BAR | Potsdamer Straße 102 | I’ve been told that Berlin has the best clubs in the world. It’s a shame I don’t like clubbing much. Never have. I prefer hanging out on a barstool until 3am instead. This is a great and wonderfully old-fashioned place to do it. The dim light, the deep leather seats, the bar staff in their pressed shirts could all be in a scene from Mad Men. A whiskey sour, please. Whenever I travel to a foreign city, I prefer apartments over hotel rooms. Makes me feel more at home. Here are some places I’d move into if I didn’t already live here and which I think you might like to rent: LINNEN (Eberswalder Straße 35), GORKI APARTMENTS (Weinbergsweg 25) and CIRCUS APARTMENTS (Choriner Straße 84). This entry was posted in beauty, design, fashion, kids, shops and tagged Berlin, Cityguide. Bookmark the permalink. Post a comment or leave a trackback Trackback URL. Ich liiiiebe Berlin und träume davon, wieder dort zu leben (2004-5 war ich dort zum PJ). Deine Tipps sind für mich zum größten Teil neu und pushen die Vorfreude auf meinen Kurztrip im April. Die airbnb-Wohnung ist schon gebucht, in Friedrichshain, meinem Kiez von damals. Schnüff. In einem Punkt stimme ich dir allerdings nicht zu. Du schreibst, dass Berlin vielen gehört, nicht nur denen mit viel Geld. Das habe ich anders wahrgenommen. Ich fand immer, dass es in Berlin ein Schicht von Menschen gibt, die sich für die “Berliner Elite” hält, und zwar für die szenige/kreative/lebendige Elite. Wer nicht ein bestimmtes Auftreten, ein bestimmtes Styling/Nicht-Styling hat, wird in bestimmten Orten und Straßenzügen geradezu als Spießer oder – noch ärger – als Tourist angesehn und abgewertet. Auch deine tollen Tipps sind nicht wirklich “demokratisch”. Versteh mich nicht falsch, ich brenne darauf, einige der Adressen zu erkunden. Aber demokratisch sind diese Adressen nicht. Der normale Berliner hat nicht das Geld für von Hand geröstete Kaffeebohnen und belegte Stullen die so viel kosten wie eine BVG-Tageskarte. Und selbst wenne r das geld hat: Wer den falschen Look hat, wird schief angesehen. Das erlebe ich anderswo nicht so stark. Ich hab in München gelebt und jetzt in Hamburg. Diese beiden vermeintlich snobbigen Städte empfinde ich (gebürtige Hessin) als viel demokratischer und “humaner” als Berlin. Und dennoch ruft mein Herz: Berlin, Berlin, ich möchte nach Berlin! Oh Marlene, danke für deine Antwort auf meinen Kommentar. Ich hab deine Tipps schon im Kopf gespeichert und weiß genau, dass auch du nicht immer in schnieken Shops rumsitzt und teure Sandwiches konsumierst:-)) Mir war nur halt dieser Satz aufgefallen, den ich dem Sinn nach oft schon gehört habe, gerade im Vergleich mit München u Hamburg. Städte-Vergleiche sind von subjektiven Erfahrungen geprägt und meine bezieht sich darauf, dass ich oft fand, dass Berlin eben nicht “die Stadt für alle” ist sondern es eben doch eine unsichtbare Währung gibt. London kenne ich nur als Touri und könnte mir nicht vorstellen da zu leben, weil es so teuer ist. So oder so freu ich mich auf Berlin und deine Tipp! Liebe Marlene, ein Traum, deine Liste. Ein Traum. Will sofort los – ich glaub ich cancel unsere drei Wochen Italien im Sommer… Ick will nach Berlin!!! Liebe Marlene, was für eine wunderbare Zusammenstellung und was für ein wunderbarer Zeitpunkt! Ich werde die baldigen Sommermonate in Berlin verbringen und bin, obwohl ich die Stadt schon ziemlich gut kenne, doch etwas nervös und unruhig, wenn ich daran denke – so lange allein und weg von Zuhaus. Aber wenn ich, wie hier, an die geballte Ladung Tolles denke, die mich erwartet, dann nimmt doch die Freude überhand und die Abenteuerlust wird geweckt. Also, danke dafür!